Joe and Max are sitting in the same sukkah, but they see two very different things. Joe sees a structure thrown up to celebrate the festival. But Max, having studied its laws in depth, sees much more—a kind of crystallization of concepts and principles brought into physical reality. That’s what’s so often missing from our presentation of halachah—the juiciest, most fascinating part. Without in-depth study, halachah becomes a checklist of dos and don’ts. Once you dig a little deeper, it becomes a harmony of wisdom in action. So that’s what we’ll attempt to present here: not a comprehensive manual to cover everything you can and cannot do, but a guide to the principles and reasoning behind all that. We’re confident that once you get those, everything will fit in place. And your experience in the sukkah this year will be all the more enriched. First, let’s lay out those basic principles. Then we’ll see how they are derived from the original text, and how they are applied. A sukkah is a hut for shade and only shade. The sukkah must be made directly, and not happen on its own, or through indirect action. Fascinating idea—and we’ll get to it soon. The roofing of the sukkah (called sechach, with two guttural ch sounds) must be materials that grow from the ground, are detached from the ground, and do not receive tum’ah (we’ll explain that later, too). Functional design: A sukkah is for living in, as you live in your own home (just that it’s not a home, it’s a hut). What exactly is “living” will also be discussed later. A stolen sukkah is not a kosher sukkah. How do you steal a sukkah? Not so simple. Again, we’ll get to it. Aside from these, there are important safeguards added by the rabbis to ensure that these principles won’t be broken. If you live in the USA or the UK, you’re used to a measurement called a foot. Originally, the foot was the length of an average man’s foot. Similarly, the basic measurements of Mishnaic times are the width of a hand and the length of an arm. In Hebrew, that’s a tefach and an ammah. Plural: tefachim and ammot. A tefach is the breadth of a closed fist. An ammah is the length of the arm from the tip of the middle finger until the elbow, or six tefachim. We generally consider a tefach to be 3.15 inches, or 8 centimeters. An amah is six times as long: 18.9 inches or 48 centimeters.1Keep those in mind—we’ll be using them a lot. If a gap is less than three tefachim, the boards are still considered contiguous. Later, we’ll get to the dimensions of the walls and roofing of the sukkkah. An important rule to know is that if two things are within less than three tefachim of each other, they are considered to be touching, and therefore contiguous. The Talmudic term for this principle is lavud. Now let’s go through this step-by-step. The verse also tells us another thing—not about the sukkah itself, but about how we are to fulfill the mitzvah. The mitzvah is performed not just by physically being in the sukkah, but also by having in mind that we are sitting here to fulfill G‑d’s mitzvah which He commanded as a memento of the exodus from Egypt. It’s a mitzvah that encompasses the entire body and mind. 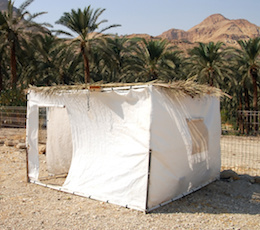 So, to put it simply, a sukkah is a temporary hut built to provide shade. To this day, there are shepherds and nomads who will throw together such structures from whatever sticks and leaves they find lying around. A house, on the other hand, is a structure made for permanent use that protects not only from the heat of the sun, but from everything else the sky may throw at you as well. It may be used for human occupancy, or for storage, or simply to provide privacy to get some work done. Note the awning, pulled out when unoccupied, retracted all but one tefach when in use. What about that tree? Let’s say you built your sukkah and then realized it’s under a tree. Any part of your sukkah that’s covered by the branches of that tree is considered as though there is no sechach there at all—since the sechach you put is not serving any function. You’ll want to either move the sukkah or cut back the branches of that tree. But just cutting back the branches is not enough—since the sukkah was not built as a kosher sukkah (more on that later). Later, we’ll discuss the solution to this problem. Now, here’s a common situation: You’re being resourceful and using a wall of your house as one of the walls of your sukkah. Problem is, there’s an eave of that roof that extends over part of the sukkah. If you’re sitting there, you’re not in the sukkah. Best to put some sort of marker in the sukkah so people will know where not to sit. Can that wall still be considered one of the walls of the sukkah (we need a minimum two and a half walls)? We’ll get to that in part 4. How Much Shade Is Shade? On the other hand, if your sukkah’s sechach is so thick that rain can’t get through, it’s more of a house than a sukkah—and therefore not kosher.16Can I place a clear glass covering over my sukkah? 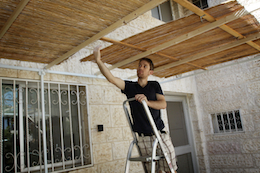 That answers a very neat question: Can I place a clear glass covering over my sukkah? The sechach is still providing shade, right? But since the glass doesn’t allow rain to get through, it still disqualifies your sukkah. You want to do your best. So, what’s the optimum thickness for sechach? That’s a matter of debate. Some say you should be able to see the stars through the sechach at night.17 Others pile it on and make it very thick.18 But no worries—perfection is still attainable. You follow the latter tradition, and keep the first opinion as well by simply leaving one area of the sechach through which you can see the stars. See Rabbi Yehuda Shurpin’s article Energy Through the Cracks of the Sukkah for more on this. How do you “make for yourself” the festival of Sukkot? And why is only Sukkot described as a holiday that you “make”—and not just celebrate or observe? Think about that a little more and you’ll realize that it’s not just the dwelling in these sukkahs on Sukkot that makes it Sukkot, but our building them for Sukkot as well. Building the sukkah is itself a mitzvah.What if a sukkah appeared all on its own? You didn’t make Sukkot. 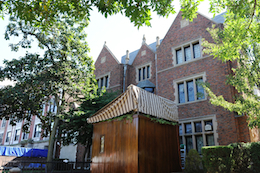 Which now brings us to an interesting question: What if the sukkah appeared all on its own? Let’s say the wind blew it together. Or perhaps someone built it over a month ago, not thinking of Sukkot. Or perhaps it was built to shelter animals, or for some other purpose. In all these cases, the sechach was not laid down for the mitzvah of the sukkah. You didn’t make Sukkot. Now it gets more fascinating: Let’s say you put up this sukkah and lay the sechach over it, all for the sake of building a kosher sukkah for Sukkot. Problem is, it was raining when you built the sukkah, so you put a shelter over your head—and your sukkah—while you were building. Now that the holiday is about to start, you remove that shelter. Did you make Sukkot? No. Because the sukkah became a sukkah only when you removed that shelter. It didn’t become a sukkah through your action of building it. You didn’t make it—it became. But don’t fret—there’s a simple solution: Walk inside your sukkah with a long stick (or climb on a ladder, or whatever), push up the sechach of the sukkah, and let it back down again. Now, when you are letting it back down, you are directly making your sukkah—and thereby rendering it a kosher sukkah. There are other examples. You may have built your sukkah and then discovered tree branches hanging over it. As we learned above, anything under those branches was not built for shade, and is not a sukkah. Cutting the branches back now won’t be enough—again, you’ll have to do the long-stick-lifting trick to make your sukkah kosher. Before laying down the sechach, make sure you first have three walls. Another example: A sukkah must have walls to be a sukkah. Let’s say you assembled a structural frame, place the sechach on top, and then paneled the frame with walls. When did the sukkah become a sukkah? When the walls were placed in. But, as we said at the very outset, the sechach is what makes a sukkah a sukkah. Turns out that this sechach became a sukkah only indirectly—by the placing of the walls. Again, do the stick-lift trick and make your sukkah by placing down the sechach. One last example: We’re about to discuss what makes kosher sechach. One requirement is that it is no longer attached to the ground. Let’s say you trained crawling ivy over your sukkah, and only then cut it from the ground. Again, no good. The sukkah was not made a sukkah by the placement of the sechach. Get out that stick and make it right. The plain meaning of the verse is that Sukkot is celebrated in the season when all the wheat has been harvested and threshed, and the grapes have been picked and pressed. But then, as we pointed out, the verse is also telling us that this mitzvah of the sukkah is what makes it Sukkot. If so, when the Torah says to make Sukkot “with your gathering from your threshing floor and from your wine vat,” it’s also telling us how to make the sukkah that will make it Sukkot: The sukkah must be from materials similar to whatever you’ll pick up from your threshing floor. So, what do you pick up from your threshing floor? Materials that grew from the ground, but have already been uprooted from there.22 Now we know what makes kosher sechach.So much for cement, metal poles, leather hides and plastic sheets. So much for cement, metal poles, leather hides and plastic sheets. None of those are from vegetation that grew from the ground. Neither will training ivy or sunflowers over your sukkah do any good—as long as they are attached to the ground (see the long-stick-lift trick for fixing this, described in part 2 above). Western cedar is a popular choice for sechach in temperate zones. Typical materials for sechach depend on climate. In temperate climates, it’s often western cedar. In a Mediterranean climate, it’s often palm branches. Bamboo is also a good choice. Now, to cut corners, some bright guy came up with the idea of taking a large plank, punching holes in it, and laying that over his sukkah. Nice idea, but unfortunately still doesn’t cut it. Since the plank was not good for sechach to begin with, punching holes doesn’t make it kosher. 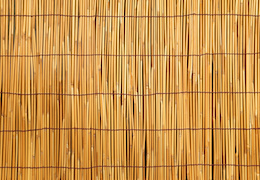 A bamboo mat can make a convenient sechach, but you’ll need assurance it was not made for household use. Once something has become a utensil, it becomes capable of receiving tum’ah. Tum’ah is a very weighty concept discussed in scripture and in the Talmud. It’s usually translated as “ritual impurity”—which puts it in a neat little box without really explaining anything. But, to make it simpler than I should: Certain things and people become unfit for use in the Temple, or for tithes to the priestly class, because they have come in contact with a dead body or some other source of tum’ah. What’s important to us is that only utensils, food, drink and human beings can carry this tum’ah. Raw materials are unaffected, no matter who or what touches them. The materials used for sechach cannot be made of any of those things that can receive tum’ah—even though they haven’t received the tum’ah in actuality. So strike out any utensils from your sechach list, such as broken furniture, old cotton t-shirts, hemp rugs and bamboo sleeping mats. Strike any sort of food off your sechach list. How about using some of these non-sechach materials to support the sechach? For instance, using a frame of metal bars or mesh to hold cedar branches. We don’t do that, since it may lead someone to think that the metal bars are kosher sechach. But if someone went ahead and did it that way, we can still use that sukkah—as long as there is more of the kosher sechach than whatever is holding it up. But then, it’s likely you’ll need some sort of frame to hold up your sechach. 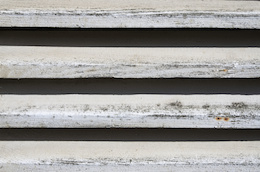 People use thin wooden lattice slats, one-by-twos, or long, straight branches for this purpose. You can even nail down this framing material if necessary. Ponder those few words a little and you’ll realize that the experience of the sukkah is a paradoxical one: On the one hand, you have to dwell in it, and dwelling doesn’t mean hanging out once in a while for a little shade. It means this is your place, your dwelling, the home in which you live. You are making yourself at home in a dwelling that’s purposely not a home. On the other hand, it’s a hut built for shade—not for dwelling. So you are making yourself at home in a dwelling that’s purposely not a home. And that’s the mitzvah. Since that’s the mitzvah, it has import on how this sukkah is going to be designed. Design reflects function. For one thing, it has to be able to facilitate the basic things you do in a home: eating and sleeping. If you can’t do that in this sukkah, it’s not a kosher sukkah. On the other hand, the design has to be a reminder that this is not a home. It’s just shade from the sun, as G‑d protected us from the sun as we left Egypt. You have to be able to aware of that shade above your head. Important to note: Really, anything you would normally do in your home should be done in your sukkah for those seven days. Want to chat with a friend? Do it in the sukkah. Read a book? Pull that La‑Z‑Boy into your sukkah. Have a home office? Why not make it in the sukkah too? Just that those don’t define the structure of the sukkah, as eating and sleeping do. How much room do you need to eat inside a sukkah? Well, you need enough room for your table and food. And then you’ll have to get your head in there. And if most of your body is not in there, you can’t really be said to be eating in the sukkah. So that’s gives us one clue: A sukkah must be big enough to contain your head, most of your body and a tray with your food. How big is that? The Talmud determines that you’ll need an area of seven tefachim by seven tefachim with a height of ten tefachim bare minimum to do this. And so, that’s the minimum requirements for the surface area of your sukkah.29 Note that this can’t possibly mean 49 square tefachim in any shape or form—since a human body does have certain limitations. That’s bare minimum. But keep in mind that you’re supposed to be living in this sukkah just as you would live in your house (even though it must not be a house). Most of us non-street-people wouldn’t live in a house where we would have to cramp ourselves into a little ball just to sleep. You need to make your sukkah spacious enough that you would feel comfortable eating and sleeping inside it. Bring in comfortable furniture, a nice table, proper lighting—make yourself at home in this hut. In practice, you’ll find many sukkahs that could showcase in Better Homes and Gardens. As you recall, the sechach is there as a memento of the clouds of glory that protected us in the desert. If the sechach would be twenty amot above your head, you probably won’t be aware of it—and that awareness is part of the mitzvah. You also recall that sechach is all about shade. At twenty amot, the shade is no longer from the sechach, but principally from the walls. And then there’s the issue of this being a hut and not a house. It’s not often you see a hut 9.6 meters tall. That’s more of permanent structure, a.k.a. a house. As far as maximum width and breadth, the earth’s the limit. 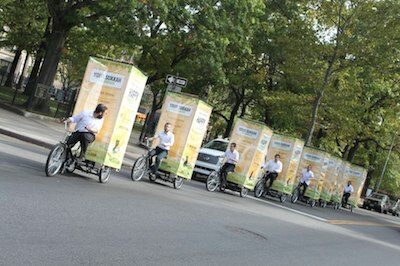 The optimum sukkah, the rabbis say, is one that can fit inside it every Jew in the world. 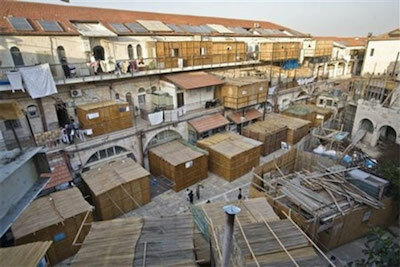 Back to functional design: Without walls, a sukkah can’t be called a dwelling. The minimum requirement for a shade-providing dwelling is just two walls plus a third small extension. The two walls can’t be parallel, though—that’s not a living space if you can walk right through it. So they’re two perpendicular walls, with the third extension from one of them. Theoretically, that extension needs to be only four tefachim wide. It doesn’t even have to touch either of the two walls. You could place a pole a little wider than a tefach within less than three tefachim of either of them (recall the lavud rule in the intro), and add a beam above joining that pole to the wall, to make a kind of doorway. But practically speaking, nobody does that. Use three full walls minimum, four optimum. You can make these walls out of just about anything, as long as they will stand in a common wind. None of the restrictions of sechach apply. People have made sukkahs by removing a ceiling over a room in their house, over their convertibles, within transparent fiberglass walls or tightly pulled canvas. You could even ask your friends to stand around and be a wall for your sukkah—if you have real good friends. These walls do not remain firm in the wind, and are therefore questionable. A hut is not a tent, so you can’t have walls flapping back and forth. If the walls are canvas or some other fabric, they should be tied so tightly so that they don’t move in a common wind.30 That’s very difficult, and never optimum. Better to make at least the first ten tefachim from the ground up out of something solid. You can weave the canvas into that solid wall, or lay the canvas over it. The same applies to using a tree or a bush for a wall: If it moves in a common wind, it has to be tied tightly so it will stand still. Let’s say you make a wall something like a posted fence, with spaces between each post. As long as the gaps are less than three tefachim (9.45 inches or 24 cm), you’re okay—even if the posts are as narrow as your finger.32 That applies both with vertical gaps and with horizontal ones. Comes out that, unlike the sechach, you could have a wall that’s composed mostly of gaps. As for windows and doors, as long as there isn’t a gap of ten amot in the wall, it’s still a wall. As we brought up earlier, you may have resourcefully built your sukkah next to the wall of your house, using that wall as one of the three required walls of your sukkah. Problem is, the wall has an eave or awning that stretches over your sukkah. Obviously, that eave is not kosher sechach, and as we said, you can’t fulfill the mitzvah sitting under it. Our question now: is it still considered a wall of your sukkah? To solve this problem, we have a tradition that Moses received at Sinai. There are quite a few of these that were not written down until Talmudic times, but turn out to be quite helpful. They are called halachah le-Moshe mi-Sinai. In this case: Imagine one of the walls of your sukkah was bent. Is it still a wall? Well, this wall is also bent. So it could still be a wall—a bent wall. But the rule states that bending has its limits. If the eave extends more than four amot outward, we can no longer apply this rule. Four amot is quite a bit, so most eaves are okay. Just, as stated above, make sure everyone knows that they’re not fulfilling the mitzvah of sukkah while sitting directly under that eave. 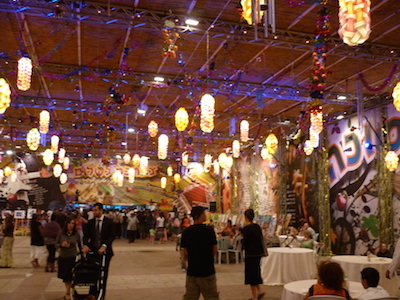 Elsewhere, we deal with the rules of eating in the sukkah. Basically, meals are to be eaten in the sukkah for all seven days, but snacks outside the sukkah are okay. Nevertheless, many people are careful only to eat in the sukkah, no matter how small a nosh. So let’s say you don't have your very own sukkah, or even if you have one at home but you're on the road during the holiday. The kids are screaming, “When can we eat our salami sandwiches already? !” and you see a sukkah sitting right there on somebody-you-don’t-know’s front lawn, and he’s not at home. What do you do? If you walk in and grab a nosh, are you “stealing” his sukkah? What is that “for yourself” doing there? There are other mitzvot where we are told “make for yourself”—like the tallit, or the four kinds we take on Sukkot. In those cases, it means you have to own the object of the mitzvah. If you want to say a blessing on a tallit, it has to be your tallit. The same with the four kinds—you have to acquire them, or someone has to give them to you (at least temporarily). So perhaps here, too, the verse is telling us that the sukkah must belong to you. Maybe you can’t be a guest in someone else’s sukkah? Why the difference in interpretation? So, instead, the rabbis of the Mishnah understood this verse to mean something else: That you can’t fulfill the mitzvah of sukkah with a stolen sukkah. Let’s say Joe and his fellow (Jewish) hoodlums break into Max’s sukkah, chase out Max and his family and sit down to enjoy the sukkah. Have they stolen the sukkah? Not quite. You can’t steal something, halachically speaking, by simply sitting inside it. Real estate simply is not stolen that way. Joe and his gang have committed a crime of invasion of private property. They can’t say a blessing on their mitzvah, since it’s a mitzvah facilitated by an act contrary to Torah. And I doubt that Max would consider them to be guests in his sukkah. But they haven’t stolen anything, so technically, they are performing the mitzvah. This gets yet more ironic when we look at things the other way around. Let’s say Joe and some fellow homeless people have come and built a sukkah—using their own materials—on Max’s property. Max decides this does not please him, calls the cops and chases them out. Now Max and his family sit down and enjoy a free sukkah. Problem is, it’s built from the property of someone else who never gave permission to use it. And since it’s sitting on Max’s property, his sitting in it is a form of (illegal) acquisition of property. Max and family are not fulfilling the mitzvah of sukkah, because they’re sitting in a stolen sukkah. The same would apply if Max drove off with a sukkah Joe built on the back of his pickup truck or on his yacht—even if the truck or yacht belonged to Max. 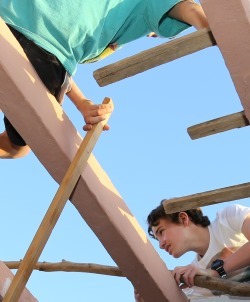 We’ll go further: This time, Joe asked Max if he could build a sukkah on Max’s property. Max said yes. Joe built the sukkah. Then Max barged in and chased Joe away. Now, who is stealing from whom? Turns out that no one is stealing a sukkah. Since Max lent Joe the property on which this sukkah is built for all seven days of the holiday, the property is still Joe’s property. Max may have committed a crime, but he hasn’t stolen a thing. Of course, all of this is de facto. Without an invitation, Joe should not be entering Max’s sukkah while he’s sitting there. Maybe Max doesn’t feel comfortable about someone watching how he eats, especially uninvited. In which case, you can throw out the “mi casa es su casa” line—you’re no longer being told to make yourself at home. The same goes with Joe building a sukkah on Max’s property. Sure, Max appreciates someone doing a mitzvah on his property—but there are limits. We’re talking about a structure that’s going to be up for at least a week—and in such a case, Max might not be so happy. Which means the structure is a stolen sukkah. But, We assume that Max would be delighted that another Jew is using his sukkah for a mitzvah.as above, if it’s an empty sukkah, and Joe is not damaging anything, we assume that Max would be delighted to hear that Joe is using his sukkah for a mitzvah. Always better to ask permission, but as to our original question, if you and your kids drop into this Jew’s empty sukkah for a sandwich, as long as you don’t damage anything, you’re perfectly okay. Now let’s say Joe doesn’t barge into Max’s sukkah, but he does cut branches from Max’s cedar to use it for sechach. Obviously, he’s committed a crime of thievery, but is his sukkah a stolen sukkah? Depends. If Joe is willing to pay Max for the stolen branches, then he can rely on a ruling of the Talmud that makes the sechach his, so that he won’t have to tear down the whole thing and start all over again. But if he has no such intent, then yes, it’s a stolen sukkah. So be careful where you get your sechach from. If you’re cutting it yourself, get permission from the owners of the property first. Best if you pay them something beforehand, in case they change their mind. If they are not Jewish, pay them or someone else (who won’t be sitting in your sukkah) to cut it. And cutting from public property is a big problem, since it’s much harder to get permission. What about if you have no space on your property to build a sukkah? Can you build it on the sidewalk, or some other publicly owned area? With public permission, however, there is no problem. So park your sukkahmobile in a public parking space, and invite others to participate in the mitzvah. According to Rav Avraham Chaim Naeh, Shi’urei Torah. See Midrash Tanchuma, Parshat Beshalach. Tur and Shulchan Aruch, Orach Chaim 625. See Likkutei Sichot, vol. 32, p. 148. Shulchan Aruch, Orach Chaim 635:1. Shulchan Aruch, Orach Chaim 629:18; Shulchan Aruch ha-Rav 629:29. See Shmirat Shabbat Kehilchatah 24:15; Shulchan Aruch ha-Rav 315:15–18. Halichot Shlomo 2:8, 20; She’arim Metzuyanim ba-Halachah 135:5 (Kuntres Acharon). Shulchan Aruch, Orach Chaim 627. Also see ibid. 638, where it’s explained that it’s best not to use any of those decorations for any other use until the holiday is over. See Shulchan Aruch, Orach Chaim 631:4, and Shulchan Aruch ha-Rav 631:1. Minhagei Maharil, Hilchot Sukkah 15. See Likkutei Sichot, vol. 22, p. 122. Talmud, Sukkah 11a; Shulchan Aruch, Orach Chaim 629. See ibid. 629:15–17 for more details. Shulchan Aruch, Orach Chaim 630:10; Magen Avraham ad loc 16. See also Shulchan Aruch ha-Rav 362:2. Shulchan Aruch 630; Magen Avraham ad loc 16. See Likkutei Sichot, vol. 19, pp. 348–350. For this entire section, see Shulchan Aruch ha-Rav 637. Re: Tunnel Your question is not clear to me. Perhaps you mean that you want to build four walls without any opening and enter through a hole in the ground. That's quite novel, and I can't think of any problem with it. Your guests might not be so pleased. Anonymous in Bnai Brak As you described, it sounds okay. Enjoy! Re: Pergola Generally, the solution is to use boards, or even lattice slats, for the first 80 centimeters. A rope that holds the curtains in place so that they don't flap at all in the wind is also a solution. Again, it's the first 80 cm. that's vital. 3 walls Thanks for such an interesting article Rabbi! I was wondering wether when you say the sukkah must have at least 3 walls, you mean it would be in a triangle shape or in a square structure having just 3 walls covered, and one free. Re: trampoline base It sounds like a lot of fun, but I'm wondering about the "interesting dining experience." You're supposed to live in the sukkah just as you would live in your home. You need to be able to sit at the table comfortably with your guests and have a pleasant meal. So this doesn't sound like functional design.